Evenweave Throw. White  - $20.26 : Yarn Tree, Your wholesale source for cross stitch supplies. Item 4232. Stitch a pretty throw for those chilly days. 100% cotton, with blocks separated by a woven double border. 16 count. Each of the 35 blocks is 4¾” square. Throw measures 32”x44”. 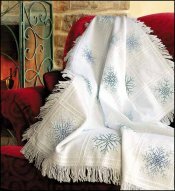 Instructions for fringing are included, as well as a free snowflake design. Color: White.